Miniature Schnauzer Characteristics: The spirited and loving Miniature Schnauzer is a breed of small dog classified as a member of the Terrier Dog Group (AKC:1926). The Miniature Schnauzer, is characterized by its muscular but diminutive appearance with a long, rectangular head with V-shaped eyebrows that extend over the eyes, and thick whiskers over the chin. Other characteristics include dark, medium sized, oval shaped eyes; small, V-shaped, drop ears; a small, high set tail and a long, fluid gait. The temperament of the Miniature Schnauzer can be described as Friendly, Alert, Obedient. The coat type of the Miniature Schnauzer is described as hard, wiry outer coat in assorted colors. Due to its characteristics and qualities, the Miniature Schnauzer demonstrated the desired traits of a Hunting Dog and is known by its nick name the "Little Beard". The origin of the Miniature Schnauzer dog breed was in Germany where it was developed in the 1800's. Miniature Schnauzer Breed Group and Dog Type - Terrier Dog Group (AKC:1926): The Miniature Schnauzer is one of the many breeds of dogs that belong to the Terrier Dog Group (AKC:1926). Other names for the Miniature Schnauzer: The Miniature Schnauzer is known by the nickname of the "Little Beard". Other names for this breed of dog include the Zwergschnauzer (meaning Dwarf Schnauzer). Origin of the name: The origin of the name "Miniature Schnauzer" reflects the small size of the dog and the word "Schnauzer" is from the German word 'schnauze' meaning muzzle or snout. (All sizes of Schnauzers have a distinctive long-bearded muzzle). The breed name is said to have originated their name from one dog called "Schnauzer" who was exhibited at the 3rd German International Dog Show in Hanover, Germany in 1879. Miniature Schnauzer History and Origin: The country of origin of the Miniature Schnauzer breed was in Germany during the 1800's. The Miniature Schnauzer was developed by dog breeders in Germany from the Standard Schnauzer and is the most recent and arguably the most popular of the three Schnauzer breeds (Miniature, Standard and Giant Schnauzer). The Miniature Schnauzer was developed in the 1800's by German farmers who wanted a smaller version of the Standard Schnauzer that was even more suited as a ratter. The breeders crossed the breed with the Affenpinscher to produce a Miniature Schnauzer that retained the look and characteristics of the breed but acquired the compact but strong frame of the Affenpinscher. The first Miniature Schnauzer was exhibited in 1899, but the breed was not recognized as a distinct breed until the early 1900's. The Miniature Schnauzer was officially recognized by the American Kennel Club (AKC) in 1926. 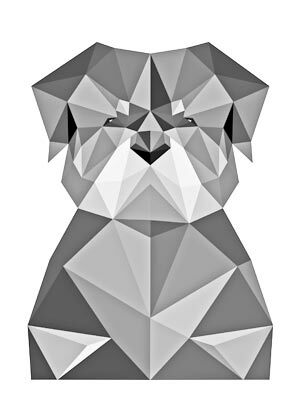 Miniature Schnauzer Modern History: The modern history of the Miniature Schnauzer moved on and the tough, clever breed is now used as a highly popular family pet and companion who lives happily in both urban and rural homes. Miniature Schnauzer Height: The Miniature Schnauzer breed is classified as a small sized dog. The height to the shoulder of a miniature male dog is 14 inches (35.6 cm). The height to the shoulder of a miniature female dog is 13 inches (33.0 cm). Miniature Schnauzer Weight: The weight of this miniature dog, in a male dog is 11-18 pounds (5.0-8.2 kg). The weight of the smaller female dog is 10-15 pounds (4.5-6.8 kg). Miniature Schnauzer Coat Type - LOW shedding coat: The coat type is described as hard, wiry outer coat. The term "Wire" refers to coarse hair. Miniature Schnauzer Coat Colors: The colors of this dog breed consist of assorted colors consisting of Black, White, Salt & Pepper and Black & Silver. Miniature Schnauzer Grooming - HIGH Grooming Needs: The dog grooming needs of the Miniature Schnauzer are categorized as high in order to maintain a healthy coat and reduce the risk of skin infections. The high grooming needs of the Miniature Schnauzer is considered to be high-maintenance and requires almost daily brushing and combing. Dog Grooming Requirements should include bathing the dog on a monthly basis and making regular inspections of the nails, teeth, eyes and ears. Miniature Schnauzer Litter Size: The litter size of this miniature dog breed ranges from 3-5 puppies. Miniature Schnauzer puppies for sale can be obtained reputable breeders and from rescue centers. The cost of Miniature Schnauzer puppies varies depending on location, pedigree history and the dog breeder. Miniature Schnauzer Temperament and personality: The temperament and personality of this popular miniature dog breed is described as Spirited, Friendly, Alert, Obedient and Loving. Miniature Schnauzer Exercise Requirements - LOW Exercise Requirements: The exercise requirements of this breed of miniature dog is low. The Miniature Schnauzer requires regular daily exercise consisting of approximately 30 minutes to one hour every day. This small dog has a long, fluid gait with small strides and only requires a fairly slow speed by the owner to meet the dogs exercise requirements. Remember that it would take a lot of extra steps by your dog to keep up with your normal walking pace. Miniature Schnauzer Diet: A fully grown Miniature Schnauzer should be fed twice a day. A diet consisting of a premium dog food can be balanced with fresh food eaten by the family. The question is What Can Dogs Eat?. Check out our comprehensive list of what dogs can and what dogs cannot eat. Miniature Schnauzer Health Problems: Potential health problems of the Miniature Schnauzer breed include Urolithiasis (Urinary Stones in the Kidney or Bladder), Legge-Perthes disease. Resolving health problems can prove to be expensive and it is always wise to obtain pet insurance or dog health insurance when buying a dog. Is the Miniature Schnauzer dog breed said to be Hypoallergenic? Answer: Yes (Refer to Hypoallergenic Dogs). Miniature Schnauzer Lifespan: The life expectancy of dogs vary according to the size, breed of dog and any serious health problems. The typical lifespan of the Miniature Schnauzer breed is 12-14 years. Miniature Schnauzer Male Dog Names: Male Dog names are most often chosen to reflect favorite names of the owner or the strength, size, coloring and country of origin of the Miniature Schnauzer breed. To give you some inspiration regarding good male Miniature Schnauzer names our small selection might be of help with naming boy dogs. Our top male dog names are: Heinrich *** Max *** Buddy *** Varick *** Buster *** Cody *** Charlie *** Oscar *** Jupiter *** Sasquatch. Miniature Schnauzer Female Dog Names: Female Dog names tend to be softer, prettier and reflect the temperament of the girl dog. Our top choice of good female Miniature Schnauzer names are Gretchen *** Wanda *** Gretel *** Roxy *** Molly *** Erika *** Sassy *** Zelda *** Senta *** Noxie.